My family has just returned from another amazing stay at the Seaside Cottages in Port Renfrew, BC. Port Renfrew is a small West Coast town on Vancouver Island. It’s approximately 110 km or 1.5 hours from Victoria, BC, if you don’t encounter any bears along the way. The small town is a little gem and is a perfect destination for a family getaway. We discovered Port Renfrew earlier this summer. Both my husband and I fell in love with this quaint town the moment we arrived. We were so impressed with the beaches (some filled with tidal pools, others with white sand beaches). Beyond the beaches you can find yourself exploring wild hiking trails. The Seaside Cottages in Port Renfrew have just been remodelled and are perfect accommodations if you’re looking at being pampered after a day in the great outdoors. These cottages have the best location in town. They are situated right on the beach. Each unit has amazing water views. You can book either 1 bedroom with kitchenette or 2 bedrooms with a full kitchen, living room and oceanfront balcony. The 2 bedroom suite sleeps 4 people comfortably. It has one bedroom with a king bed, one bedroom with two twin beds and a pull out sofa bed. The two bedroom cottage is well appointed and has everything you need to make your stay in Port Renfrew comfortable and fun. My kids love sharing the room with twin beds at the Seaside Cottages. They are also crazy about the beach which is located directly beyond the porch. They spend entire days exploring the tidal pools and collecting shells, seaweed, and creating their own adventures between the small waves. Evenings at the Seaside Cottages are spent around a private campfire with marshmallows and graham crackers. My husband and I like how safe it feels in Port Renfrew. We enjoy how relaxing it is there and we love exploring with the kids on the beach and sitting on the large balcony of our Seaside Cottage watching them have fun. When in Port Renfrew my family spends lots of time at the beach. Botanical beach is just 2.5km from Seaside Cottages. It is a beautiful – huge – beach with hundreds of tidal pools to explore. The short hike to the beach is just enough for young kids. This is a great way for everyone to be immersed in part of the Juan de Fuca trails. If you’re more into white sandy beaches you can drive over the bridge and head to Pacheedaht beach. These sandy beaches are miles long and a fun place for swimming and a picnic. Another thing we like doing in Port Renfrew is checking out the docks at the end of the day to see all the fish caught by avid fishermen and commercial fishing fleets. It’s a great opportunity for the family to help count the catch of the day. If you have a fishing licence you can also drop a crab trap and surprise yourself with crabs and starfish. The two bedroom suite at the Seaside Cottages has a stovetop, microwave and full fridge. You could bring all your food with you if you wanted to. You can also treat yourself to lunch or dinner at The Renfrew Pub (it’s just a 2-minute walk from the cottages). The Pub has a family side with a kid’s menu. The Coastal Cafe is another great option. The Coastal Cafe has delicious breakfasts and make great pizzas in the evening. Both restaurants have a great menu and drinks. My family loves to get away from it all and spend time in beautiful Port Renfrew. 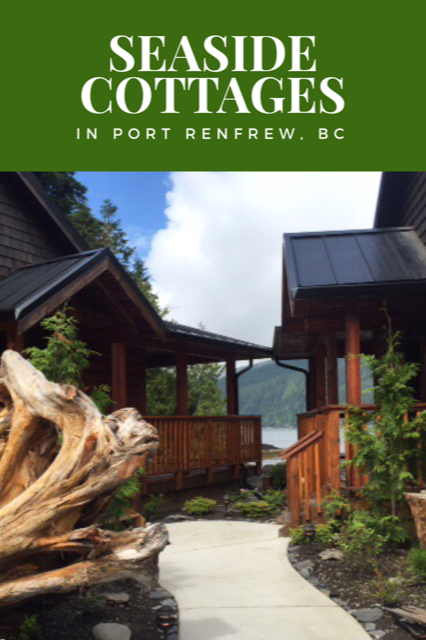 I can’t think of a better place to stay when going to Port Renfrew then the Seaside Cottages. I’d love to know, have you been to Port Renfrew? If so, what did you like about this quaint town? Such a lovely and stunning place!! This looks like a stunning place to enjoy over the summer! Such a beautiful place to visit! Love the cabins, and all those stunning views! What an absolutely beautiful spot for a family vacation! It’s a beautiful spot Jolan! Good luck! Good luck Kristen! You would love it! Wow, what an incredibly beautiful place! To have that gorgeous river right out your front door. It looks amazing. I know my family would love it! That’s actually the ocean Suzanne. Pretty incredible don’t you think? Oh, this is so beautiful! The pictures are breathtaking- what a gorgeous place that would be, to go to! I love how they all have a view of the water, so beautiful and calming! Totally entered the contest! Looks gorgeous! so beautiful! haven’t been to that part of the Island yet! Thae cabins look awesome. My family would love to visit there for sure! Looks so beautiful. The cottages look very comfortable and relaxing. What a great destination for families. I will have to tell my friends in B.C. about it. This place looks amazing! We go to Vancouver every other summer and it’s just not often enough to check out all the amazing place there! You would love Port Renfrew Viv! It is so much fun. Enter the giveaway! You would love the Seaside Cottages.